One of the benefits of owning a Palm Springs area home is being able to enjoy patio dining just about year-round. 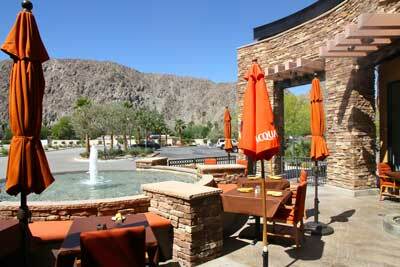 Bucatini in La Quinta is a welcome addition to the desert restaurant scene! At Bucatini, you have your choice of a nice patio area out front, a bar area, and a main dining room which is adjacent to the kitchen. For both my husband, Bill, and I, the house-made pasta tops the charts at Bucatini. Bill’s favorite is the Pappardelle Bolognese with wide ribbon egg pasta in a classic slow braised Bolognese meat sauce, topped with pecorino romano cheese. For me, it’s the Farfalle Del Contadino. This bowtie pasta dish includes grilled chicken, olive oil, garlic, mushrooms, and white wine in a tomato cream sauce. Yummy! In our two-dozen plus visits (more on that later), we’ve also enjoyed some nice salads, several other pasta dishes, such as Lasagna Emilina, several nightly specials, and a few pizzas made in the Marra Forni wood fired brick oven. And while most dishes have been very good, I say again that the pastas are the real stars at Bucatini! Every single pasta dish we have sampled was cooked al dente and sauced to perfection. Bucatini offers a great value and a friendly staff. And at the end of a long day serving our own clients, it’s great to just wander in and enjoy a nice meal with a good wine at a price that is hard to beat. We might be guilty of going there too often because we find it to be a fun neighborhood restaurant where we often see friends and clients.